I couldn’t decide whether to fix Mom’s laptop or not. At first, I thought I might, then I thought, “Why spoil her?” Then I thought how nice it was when she sat on the couch with the laptop and I curled up next to her all snuggly, and I thought I’d fix it. Then, when I did my first blog post from the desktop, I liked it, and thought I wouldn’t fix it. I could tell Mom liked that idea, but I knew she’d never do it. So I said, “Mom, if the computer loads the BIOS and starts to load Windows, the hard drive works, duh!” She had made the mistake of buying the computer new from a shop, so it didn’t come with Windows installation disks, so she couldn’t run the repair. Sure, she should have made a rescue disk, but she didn’t. Not too smart, Mom!! Anyway, she had her Ubuntu Linux installation disk, so I told her to go into the BIOS and change the boot order and boot from the Linux disk, and the computer works fine. At least she can get the few files off there that she hadn’t backed up yet. 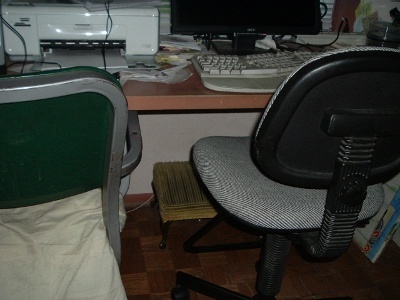 But I’m hoping she’ll still work here in the office, because I like having two chairs. The one without the pillow is the one I’m sitting in now. The one with the pillow is the one I sit in when Mom is at the keyboard. It’s close enough for me to get lots of pats, and it’s really really soft and cushy. Plus, I can get hairs all over her printer paper. Ha ha! I can also see out the window while I’m next to Mom, which I can’t do on the couch. It’s pretty exciting, and very useful. 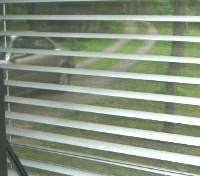 I can see when somebody pulls up in front of the house so I can hide before they come in (I don’t like company). I can watch squirrels and birds on this tree just outside the window. I can guard against the Schmeltz dogs romping all over the place, now that Joe is gone. So, all in all, I’m glad I fixed Mom’s laptop. I know she appreciates it, because she opened a can of tuna for herself yesterday, and she didn’t scrape every last fragment out of the can before she gave me the juice. Mmmmm! My favorite! A WRITING PROMPT FOR CATS: How does your human show appreciation for the things you do? This entry was posted in Caturday, Geek. Tagged animals, cats, computers, geekery, Katya, pets. You always have to help Mommy, whenever you can. I know your paws get tired. Mine do, too. We all hate Windows. Say no more. I do what I can, Jane. She’s very high maintenance, though. When I start shaking papers off his desk he shoos me off. Not very appreciative if you ask me. Mom doesn’t like it when I sit on the manuscript she’s editing. I’m just trying to hold it still so she can write, but she says, “Your daddy wasn’t a glass-maker!” Whatever THAT means! Being computer literate is soooo important! I help Mum all the time. She was most impressed when I got rid of a whole stack of emails for her. She really did have far too many in her inbox. Unfortunately I haven’t been able to find that Delete button again, but the spacebar can be fun, especially when she’s playing games and her avatar starts jumping up and down! Oh, that sounds like fun! The late Mr. Alexander Russianpants used to play board games with our people, but they always got upset when he stretched out in the middle of the board. What do they think things on the floor are FOR, besides stretching out on them, eating them, or peeing on them??? People! Meeks would love to share..Fifty Shades of… typos? Katya and I agree about flat surfaces being made for sitting upon. But she and I have had to reach a compromise about which surfaces are allowed and which are not allowed. The compromise is this: I tell her where I do not want her to sit, and she sits there anyway.